Do you want to be a key part in our detection system by supporting the detection program, specifically the Lookout Observers? Do you have what it takes physically and mentally to work with the Lookout Observers in meeting their needs? If so, a Wildfire Detection Aide position may be an ideal seasonal position for you. A Detection Aide is required to perform a variety of duties. The first priority is to ensure the Lookout Observers receive their scheduled servicing of groceries, water and warehouse supplies. In addition, the Detection Aide may need to fill the role as Lookout Observer, document and report identified maintenance needs at the lookout, and participate in the Area’s detection program by completing fixed wing patrols. Highly organized individual with excellent interpersonal and communication skills. In consultation with the supervisor, set up a spare lookout schedule with lookout staff for the season. Submit aircraft request for servicing through the Areas Wildfire Dispatch Supervisor. Document, inventory, and report all the identified maintenance and repairs required at eat lookout facility. Carry out fixed wing patrols as assigned by the Area Duty Officer. Assist in the spring opening and fall closure of the all the lookouts in the Area. As directed by the supervisor, ensure that all lookout documentation is being completed and submitted as required. Limited support may be provided to the Areas wildfire suppression efforts where participation does not conflict with the detection program. The typical work week is 36.25 hours (7.25 hours/day). You will be required to work overtime as required. Both on the job and formal training are provided. 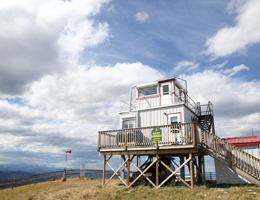 The successful candidate will be required to take the Lookout Observer course at the Hinton Training Center.